Large Munsterlander is a hunting dog breed that originated in Germany from a variety of other breeds, including pointers and other bird dogs. It used to be known as a color variety of the German Wirehaired Pointer; however, in the early 1900s, the Large Munsterlander was recognized as an individual breed in Germany. The Large Munsterlander stands between 23 and 26 inches tall and weighs 53 to 76 pounds. The head is long, with medium-sized eyes and broad, dropped ears. The body is as long as the dog is tall at the shoulders. The tail is long. The coat was developed as protection against briars and brambles in the field and is medium in length, black and white, with feathering on the legs, belly, tail, and ears. There can be differences in height, weight, and other characteristics, as the Large Munsterlander dog breed was bred specifically for its hunting abilities rather than as a show dog. The Large Munsterlander needs twice weekly brushing and combing. 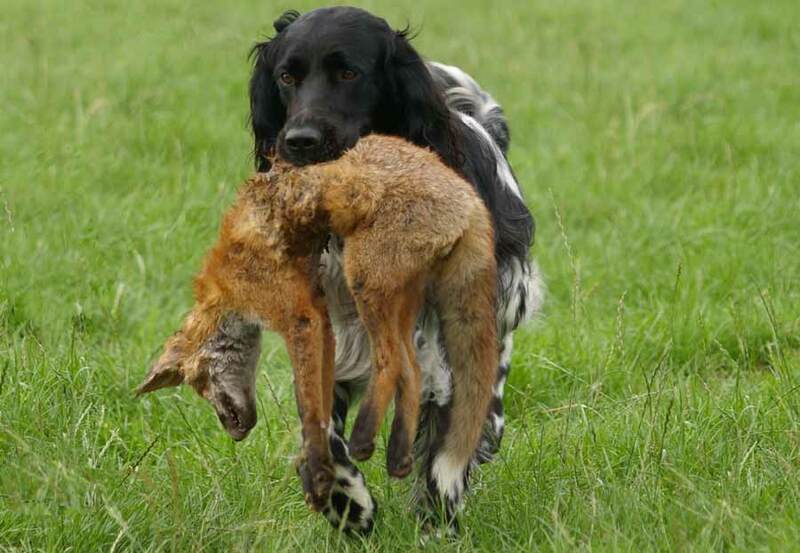 Although the coat is relatively easy to care for, it can tangle, especially if the dog has been hunting or swimming. The Large Munsterlander dogs are quite active and need daily exercise. They also need something to do; if not used for hunting, they need a chance to train in agility, learn tracking, or play flyball. A Large Munsterlander who does not get enough exercise can easily get into trouble. All exercise should be on leash or within a fencedin yard. The Large Munsterlander breed is not difficult to train, although she can be easily distracted by the scent or sight of birds. Training should be structured but fun. The Large Munsterlander breed can be quite vocal, which can cause neighborhood problems. Although these dogs are by nature friendly with other people and dogs, early socialization is nevertheless important. The Large Munsterlander is still very much a hunting dog and does best in a home where she is used for that purpose. The Large Munsterlander is great with children, other dogs, and other small pets. The primary health concern is hip dysplasia. Share your Large Munsterlander story. Note: Upload only Large Munsterlander picture or your picture with Large Munsterlander below - spammer's ip may be blocked.